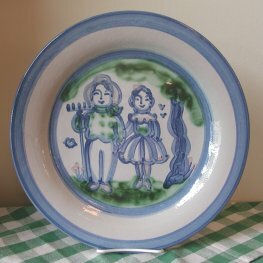 The Hadley Pottery Company was started by Mary Alice Hadley, or M. A. Hadley, in the early 1940s. Mary Alice was an artist, and she painted a variety of interesting and beautiful pieces in her life. The origins of the company go back to when Mary Alice painted some dinnerware for herself and husband to use on their boat. Friends raved about those pieces and begged Mary Alice to make more for them. She obliged, and, it wasn’t long after that that the Hadley Pottery Company was born. Mary Alice herself could often be seen at the factory in its early days, wearing a dress, heels, and pearls, as was the custom in those days, although not necessarily in a factory! Mary Alice died in the late 1960s, and the company was then run by her husband. Rumor has it that she was cremated and that her remains sat in a Hadley vessel on a shelf in the factory. Since Mary Alice and her husband did not have children, the successful business eventually became owned by others unrelated to the Hadleys. The company has changed hands a few times over the years, and changes have been made to the pottery along the way. However, an effort has been made to retain the charm and whimsy of the original pieces of pottery that first came out of the kiln 70 years ago. Today, Hadley Pottery is still very much in demand and can be seen on dinner tables across the country and beyond. The charm and whimsy of the pottery remain the same today, as each piece is individually hand-painted, the same as it was by Mary Alice Hadley herself, 70 years ago.